Things we know for certain: One, February is National Heart Month; and two, most of our clients do a lot of sitting at their desks; so it makes sense to take a break from our list of blog stories about technology, accounting, and government management and instead focus on the two things that will affect all our clients at some point—their hearts and health. The baby boomer generation is the first generation of workers who will likely spend most of their day sitting. As we moved from an industrial era to a technological one, many laborious jobs were replaced by desk jobs, putting many workers in front of a typewriter, or computer for most of their working career. Add to that the hours spent at home in front of TVs, personal devices and computers, and one thing is clear: we’ve got a sitting problem. According to a multi-year study of people between the ages of 50 and 71, the effects of sitting too much is correlated with a higher likelihood of difficulties walking later in life, when compared to people who are more active and sit less. That’s because people who spend hours sitting or laying down are more likely to have their heart muscles shrink as they age, making them less able to move around and increasing their risk of heart failure (according to the American Heart Association). But there’s good news: studies have concluded that these effects may be reversible with long-term training and exercise. A study by the American Heart Association suggests that balance and strength training over several years can actually reduce and reverse heart stiffness. Participate in an assortment of activities to improve strength, balance, and cardio fitness such as yoga, weights, and aerobics. Participate in these activities four to five times a week for optimal results. Start an exercise regimen sooner rather than later (it only gets harder with time). Build up to an optimal exercise time of one hour of moderate-intensity. Make small changes in your daily routine such as getting up to stretch every 15-30 minutes, opting for a standing desk, taking a walk at lunch or watching less television. Do things the way we used to do things. It’s so easy to hop on the computer to order groceries or get in the car to go a few miles, but it’s these small changes that have made us more sedentary. Simply moving our mindset to a time of yesteryear can get us moving more and keep us healthier. We can’t change society, but we can adapt and create a healthier version of ourselves for improved mobility and a better quality of life. The effects of sitting at a desk can be reversed by making a conscious decision to get up, get moving, and commit to a more active lifestyle. 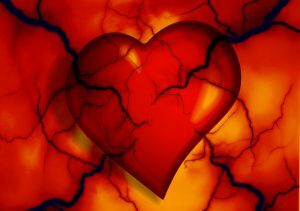 Do it for your heart and your health; after all, it is soon to be National Heart Month!